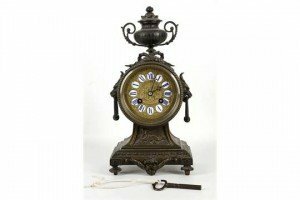 A late 19th century French mantle clock, bronzed case, D’Aureville & Lallier brass movement, urn surmount, lion mask handles, brass face with enamel Roman numerals, ribbon and floral swags, turned feet. 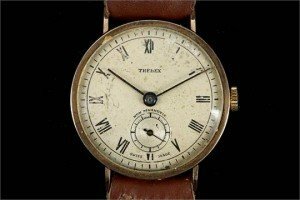 A gents vintage 9ct gold cased Trebex dress watch, with silvered Roan chapter dial and later leather strap. 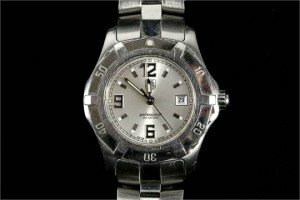 A ladies stainless steel Tag Heuer Professional wristwatch, with silvered date dial and original bracelet in brushed / polished finish. 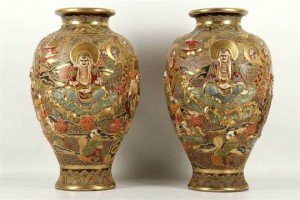 A pair of early 20th century Japanese, late Meiji period, earthenware baluster shaped vases, heavily enamelled with Buddhist priests with pagodas in the landscape. 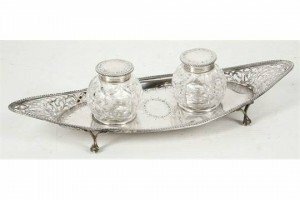 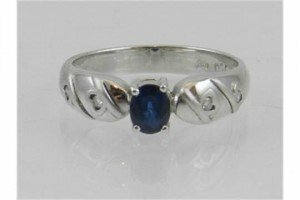 A Victorian hallmarked silver ink standish, with double glass including wells and pierced boat shaped body, with ball and claw feet. 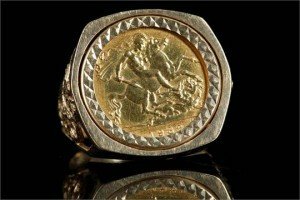 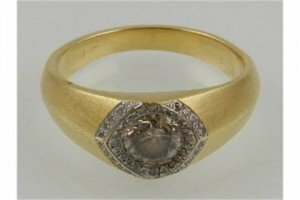 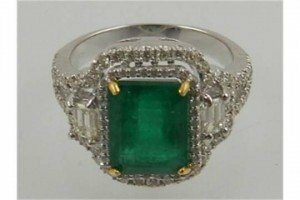 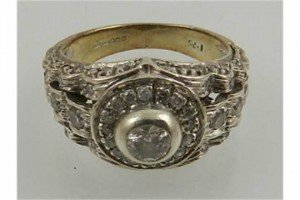 A 9ct gold and half sovereign ring, the collet mounted 1982 gold coin inset within pierced shank. 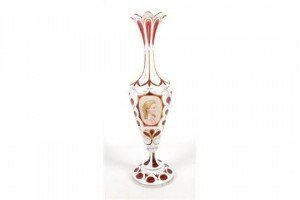 A late 19th Century Bohemian overlay stem vase, cranberry and milk glass with gilding, two panels, floral garland and portrait of a young girl. 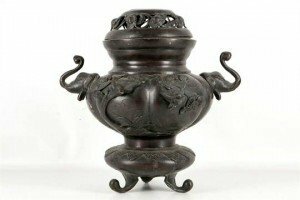 A Japanese bronze Koro censor and cover with attached stand and tripod curving feet, the body with birds modelled in high relief and elephant head handles, the cover with pierced floral decoration. 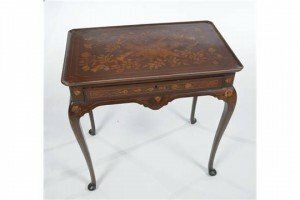 A choice 19th century Dutch mahogany and marquetry side table, the shaped rectangular top finely inlaid in marquetry with musical instruments against a floral ground with flowers and birds above a frieze drawer the sides with oak candle slides, the frieze overall inlaid with marquetry raised upon curvilinear legs and pad feet. 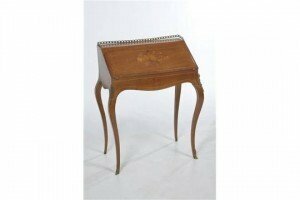 A Continental inlaid faded mahogany and marquetry ladies writing bureau with a gilt metal gallery, damaged, the hinged fall front enclosing two frieze drawers and a well with a sliding cover raised upon four curvilinear legs. 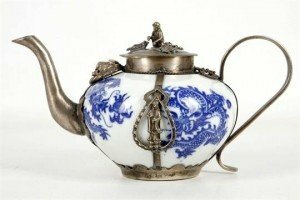 An antique Chinese export blue and white porcelain miniature teapot, mounted in silver, supported in the border by two figures of ‘Guanyin Goddess of Mercy’, the cover chased with three frogs and monkey finial, Qianlong mark to the base. 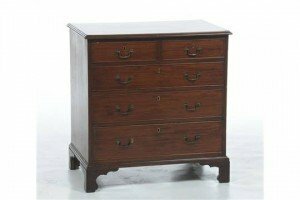 An early 19th century mahogany chest of drawers, the rectangular cross banded top with a moulded border above two short and three long graduated cockbeaded drawers, swan neck handles raised upon a plinth base and bracket feet. 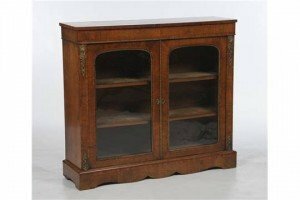 A fine Edwardian inlaid mahogany cabinet with a swan neck cresting above a frieze, finely inlaid with an urn and scrolling leaves above a pair of glazed cabinet doors enclosing two shelves, the lower side table with a rectangular inlaid frieze and an oval inlaid with a basket of fruit and leaves above inlaid frieze drawers raised upon tapering legs and spade feet. 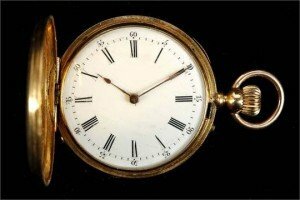 An antique 18ct gold cased full Hunter fob watch by Mermod Freres, with Roman chapter dial and crown winding 15 jewel movement. 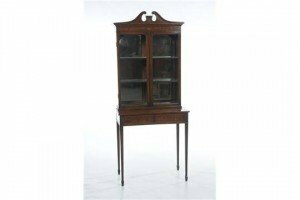 A Victorian bur walnut and cross banded pier cabinet, the rectangular top above an inlaid frieze above a gilt metal mount and a pair of glazed cabinet doors enclosing two shelves by outset columns applied with gilt metal foliate mounts raised upon a shaped plinth base. 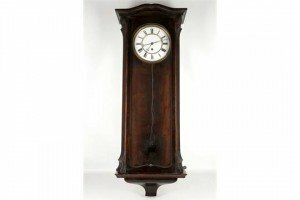 A late 19th century, unnamed regular clock, white enamel dial, Roman numerals, single weight, stained mahogany case.